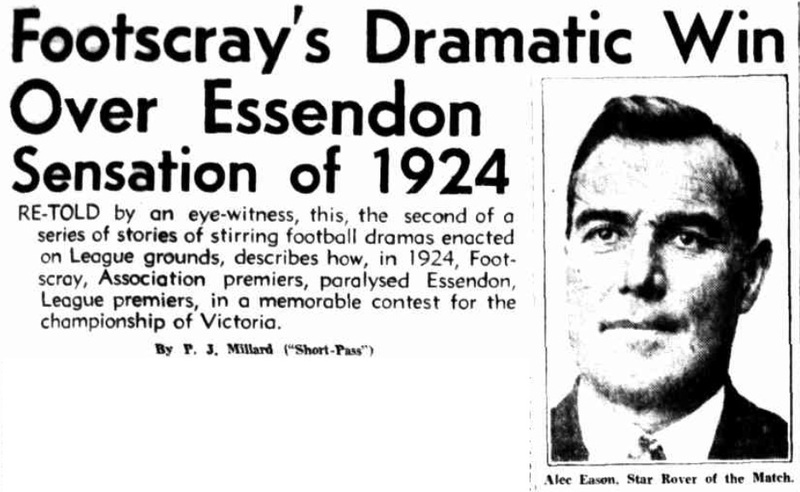 Re-told by an eye-witness, this, the second of a series of stories of stirring football dramas enacted on League grounds, describes how, in 1924, Footscray, Association premiers, paralysed Essendon, League premiers, in a memorable contest for the championship of Victoria. 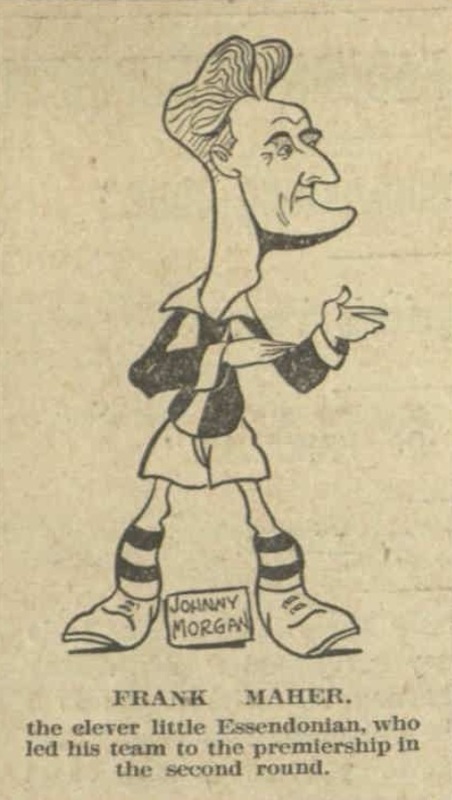 Sporting Globe 6 May 1935 p8 (Edition1). Prized more than any other football trophy in Australia, a huge pennant proudly looks down from the Footscray dressing-room wall, as if to inspire present-day players. 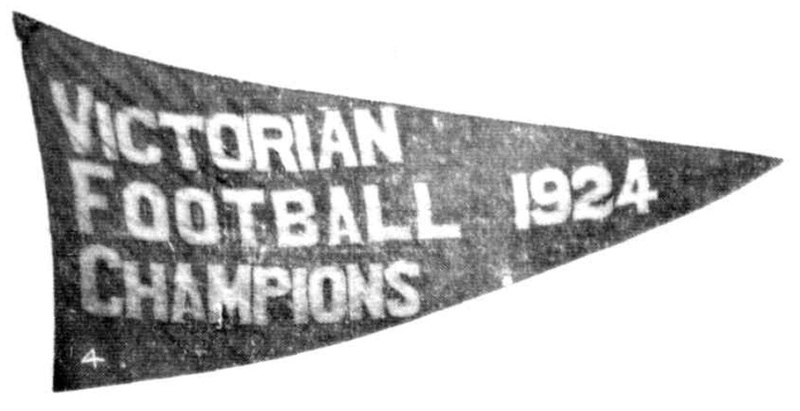 On the pennant is emblazoned “VICTORIAN FOOTBALL CHAMPIONS 1924”. 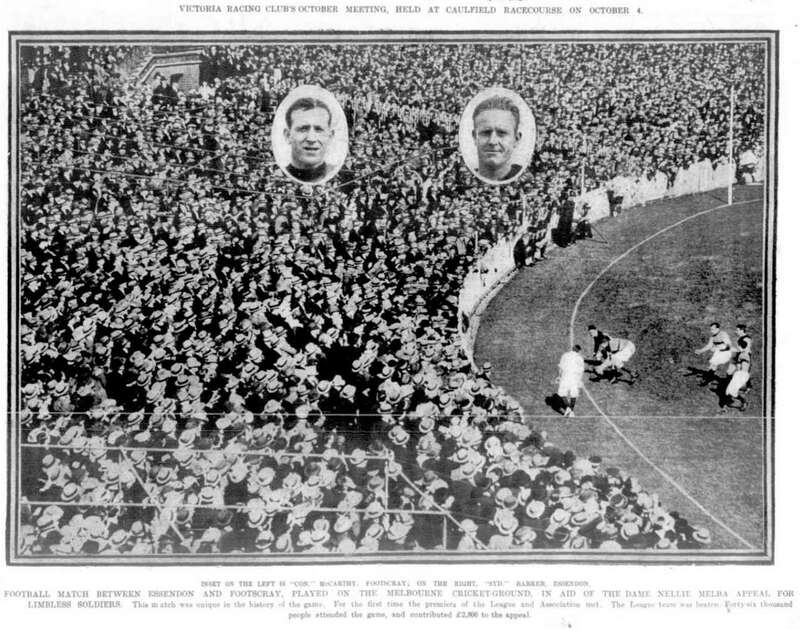 Behind those simple, eloquent words lies the most colourful football drama in living memory – that staggering, crushing defeat of Essendon, League premiers, by Footscray, Association premiers, in a memorable encounter for the championship of Victoria, at the Melbourne Cricket Ground on Saturday, October 4, 1924. As a spectacle, the play was dazzlingly brilliant, because of Footscray’s superlative form throughout. As a football drama it was ultra-sensational. The totally unexpected eclipse of the proud League premiers by a side from a supposedly inferior body was highly charged with the dramatic, and provided a thrilling climax to what, until then, had been a tame season. The result dealt League prestige a sickening blow, and gave the Association its greatest advertisement since stronger clubs broke away to form the League in 1897. Financially, too, the match was a great success, the big crowd of 46,100 paying £2800, which all went to the limbless and disabled solders’ fund. The M.C.C., generous in the sweet name of charity, lent the ground free of charge. There was a lot of sparring before the contest was finally arranged. 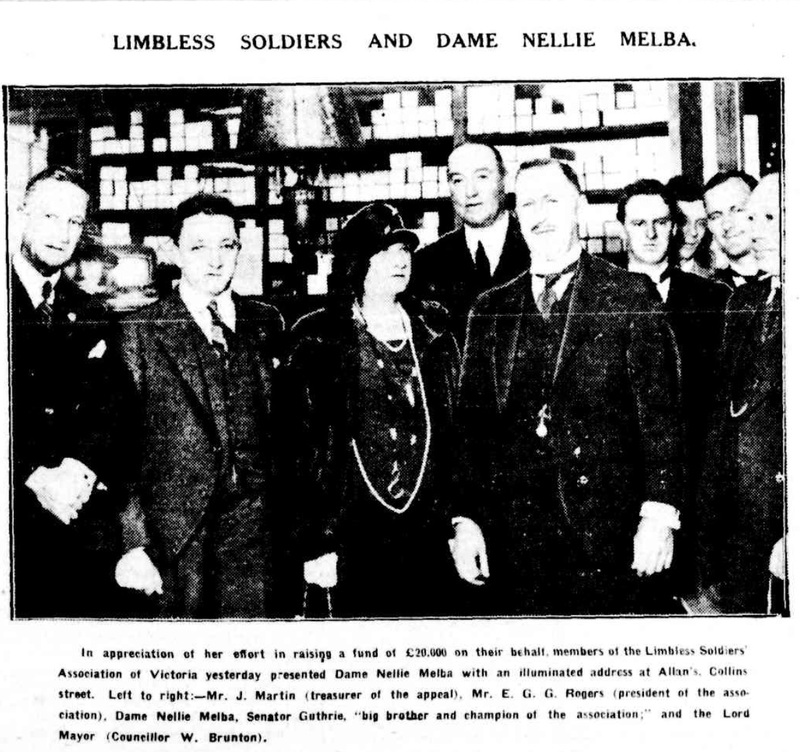 It was not until Dame Nellie Melba made a moving appeal that the rival premiers meet, and the proceeds go to disabled soldiers, that the League agreed to it. For some years, the Association, gaining steadily in strength and prestige, had been trying to come to grips with the League on the football field. 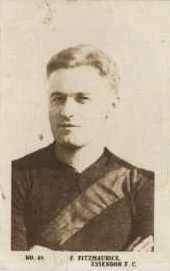 But the League, mindful of St. Kilda’s sad experience against North Melbourne then the champion Association club, in 1915, and with everything to lose and nothing to gain, had been wary. Unfortunately for itself, the League chose an unfortunate time and occasion to capitulate. 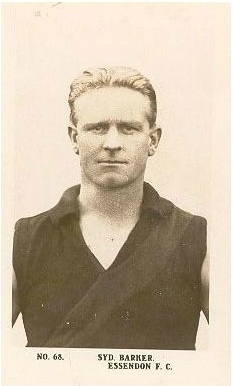 Footscray that season were undisputed champions of the Association with Con McCarthy (captain), Vic Samson and Alex Eason an invincible ruck. 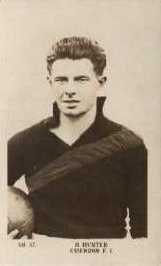 They had been defeated only once (by North Melbourne), having piled up 222 goals 291 behinds to 133 goals 174 behinds. In the final they almost annihilated Williamstown, with 11-11 to 3-4. Scoring in those days, when back men kept their places better, was not so heavy as now. Essendon’s record for the season, with five losses and one draw, was not so impressive. The Dons, indeed, were rather lucky to be premiers, as they were defeated by Richmond by 9.13 to 6.11 in the concluding semi-final, and yet they won the pennant on percentages! That season the League tried the experiment of no final match. It was a ghastly failure, and never repeated. So that Essendon, with prestige tarnished and confidence shaken, began with a moral disadvantage against the triumphant, all-conquering Footscray combination. This was to prove a strong undercurrent in the game. Footscray, too, were desperately keen to win – for more than one reason. For some time they had been hammering at the League door for admittance. This, then, was their great opportunity. And how they made the most of it! From the very start, Footscray, playing in perfect unison, threw themselves into the game as men inspired, as undoubtedly they were. Two early goals by Essendon checked them – but only momentarily. In a flash they were complete masters again, and remained so till the end. 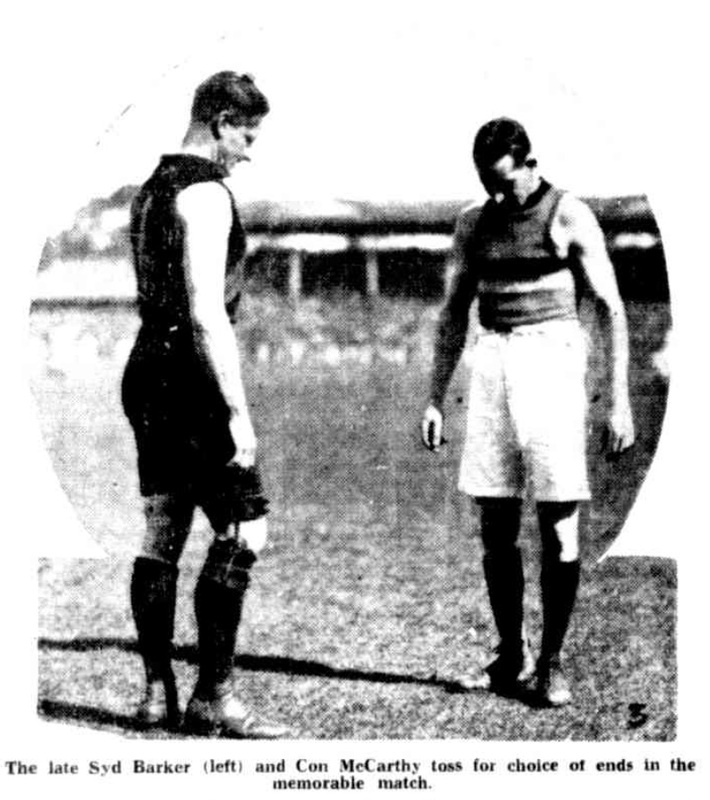 Throughout, Footscray bewildered the Dons with their terrific pace and dazzling handball – destructive counters to the advantages Essendon were supposed to possess in weight , marking, and kicking. More brilliant handball has never been seen on a football field in Melbourne. The “flick pass” was used unsparingly and unerringly. 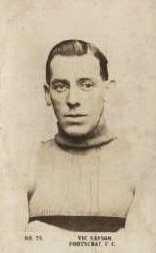 Eason, rover, and Laidlaw, centre, were the smooth, well-oiled swivels around which the handball chiefly spun. Footscray rather overdid it at times, and occasionally it seemed illegal, but, effective and spectacular, it was a sheer joy to watch, thrilling the crown again and again. 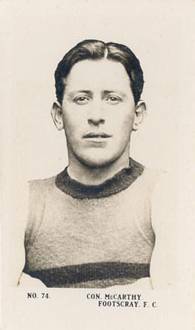 In one burst, eight Footscray men flashed the ball by hand from end to end for a goal. Long before their weary day was over, the ball, to Essendon, was a tantalising will-o’-the-wisp. How could Essendon, ragged and disorganised, live against such football and leadership! Their cause became more hopeless as the game proceeded. Syd Barker’s desperate and frequent re-shuffles were all in vain. Apart from those two early goals which enabled them to lead by 3.1 to 2.3 at quarter time, and 3.5 to 3.4 at half time. Essendon were outclassed by a far superior side on the day. Securing a grip on the game in the third quarter, Footscray were 5.8 to 3.8 at the final change and romped home easy winners with 9.10 (64 points), to 4.12 (36 points). 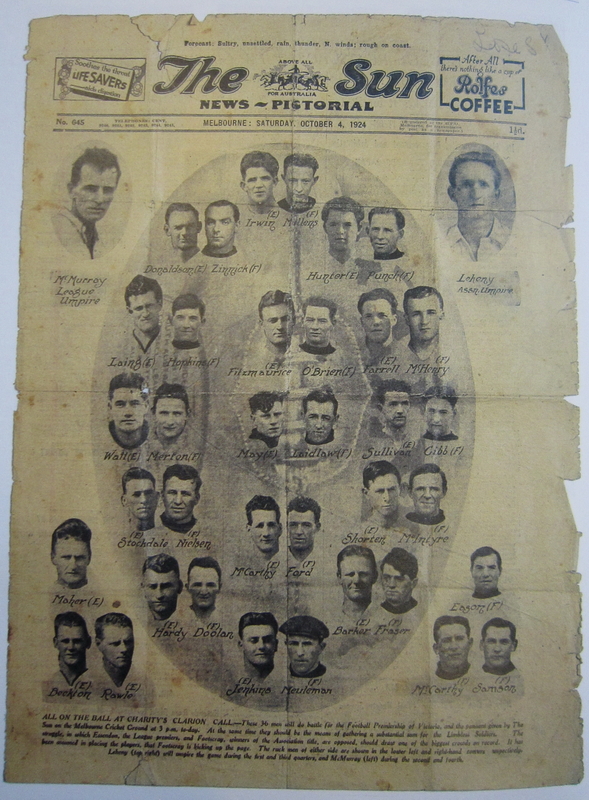 The Association premiers were champions of Victoria! Pandemonium broke loose. Cheering thousands rushed the ground. Footscray players were carried in shoulder high in triumph. For more than an hour the Footscray room resounded to deafening cheering, and what passed for singing. And the wild celebrations, which lasted a week, were only just beginning! That night all Footscray went made with joy. There were many headaches the next morning. From that day Footscray have cherished their championship pennant as founding a great club tradition. A small replica is flown from the pavilion on match days. 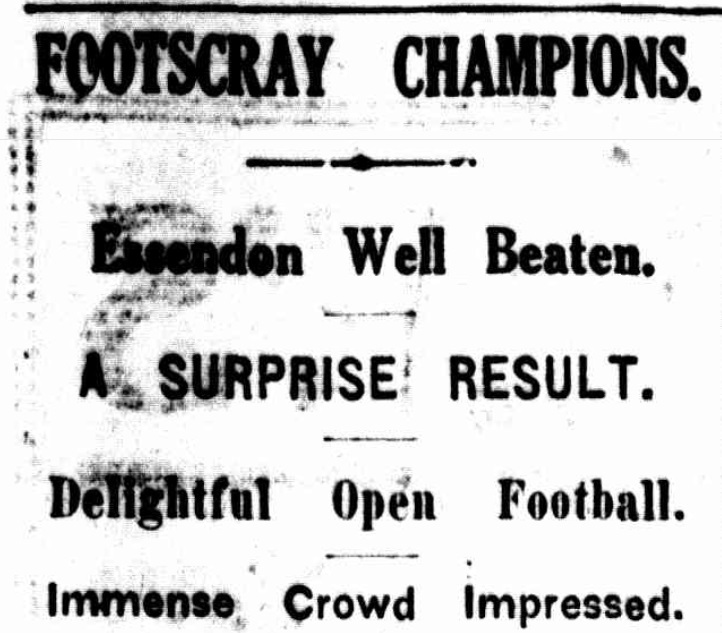 Essendon received 49 free kicks and Footscray 41. Leheny (Association) and McMurray (League) each umpired half the game. Mr H.C.A. 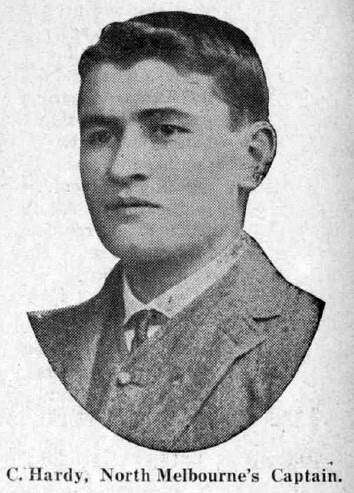 Harrison, father of Australian football, was present. Footscray had not one weak link: Samson was a sturdy defender and resolute follower. Laidlaw shaded May in the centre. Eason was a wonderful rover, with brainy, effortless play. Punch, roving and forward was smart and persistent. 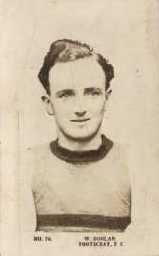 McCarthy, with his following and captaincy, was a match-winning factor. 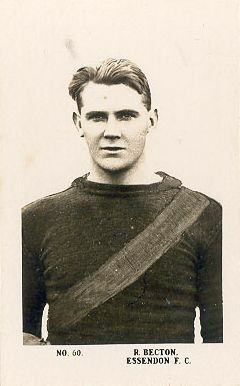 Ford was a great centre half-back. So many Essendon players were overshadowed that certain rumours spread after the match: but there was no evidence to support them. The general view of the public was that Essendon were somewhat stale, and, in addition, had been unsettled by Footscray’s surprise tactics. Indignant at reports of internal discord, Frank Reid, Essendon’s secretary, denied them. “We were beaten by a better side” he said. 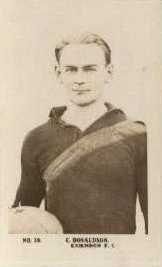 Essendon’s best players were Watt, Fitzmaurice, Donaldson, Maher, Stockdale, Irwin, Laing (until injured) and Sullivan (at times). 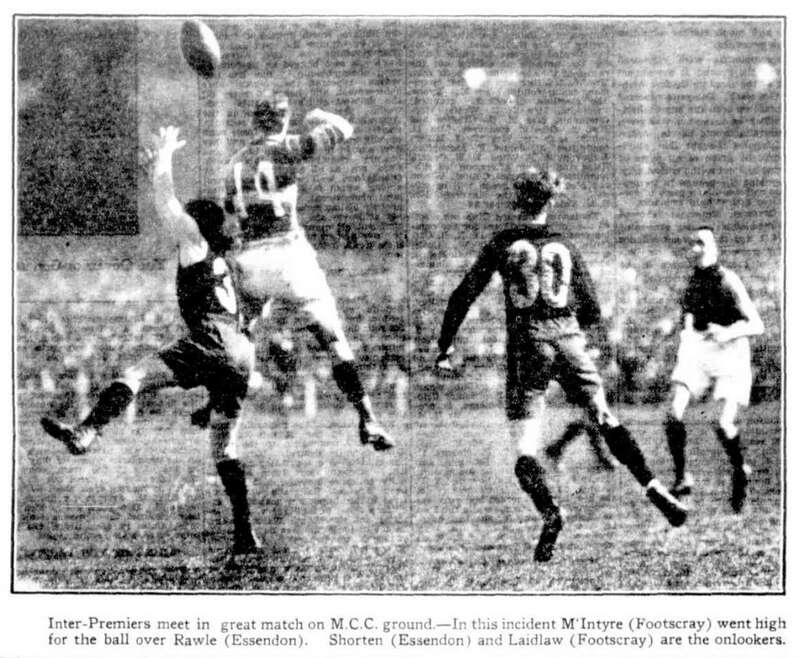 Fitzmaurice, indeed, was about the only Essendon player to hold his own in the air. The next season Footscray, with North Melbourne and Hawthorn were admitted to the League. Footscray, however, immediately found their path thorny. 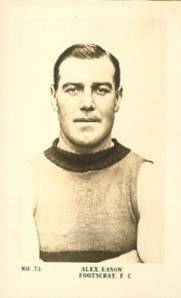 The League banned the “flick-pass” and refused Ford, O’Brien and Eason, three of their stars, permission to play, because they had joined Footscray without clearances from their League clubs. The keen Essendon-Footscray rivalry still persists, and in time will become legendary.